A photo of emotional Parokya ni Edgar’s Chito Miranda and Kamikazee ‘s Jay Contreras has been shared in various social media and has gone viral. The photo was taken by Jason Pineda during the last band gig of Kamikazee in 12 Monkeys Music Hall & Pub which is co-owned by Miranda. Miranda also reposted the photo on his Instagram account and shared that the gig was indeed epic. It was how he had described the last bar gig of the band Kamikazee which was considered by many as of the best OPM bands in the country. 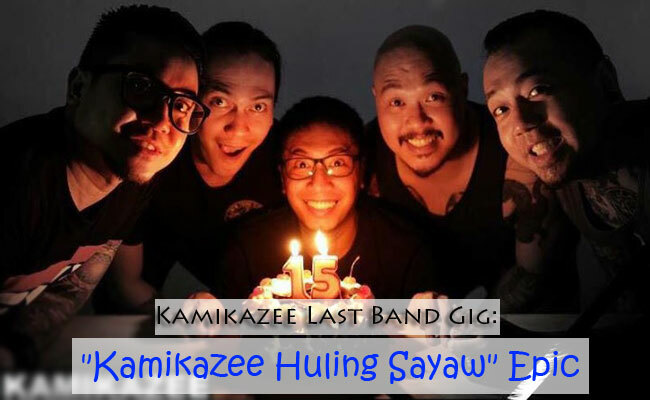 Photos of the gig had circulated on social media with hashtag "Kamikazee Huling Sayaw." Fans shared their feelings on Parokya ni Edgar’s Facebook page. Most of them said that it is a lost in the Philippine music industry as the band had helped the OPM to come alive in the lives of the Filipinos. Some also said that the gig showed the closeness Chito and Jay and how they had been proud of each other’s band achievements. Since not all of the fans were able to watch the epic gig, many were asking for videos, photos and stories. Some said that Jay had comically retold the story of how he met Chito in University of the Philippines and how Chito seemed to be boastful at the time, yet it was Chito and the rest of his bandmates that helped Kamikazee during their budding years. Many of those who were fortunate to be there also shared that Chito seemed to know every song of Kamikazee and he seemed to be genuinely proud of his friends. It was in January 2015 when the band Kamikazee announced that they will be disbanded by 2016 to individually pursue their interests. However, there are some news that the band will hold a farewell concert before 2015 ends. The band os composed of Conteras, Led Tunay,Allan "Bords" Bordeos, Jomal Linao, and Jason "Puto" Astete.